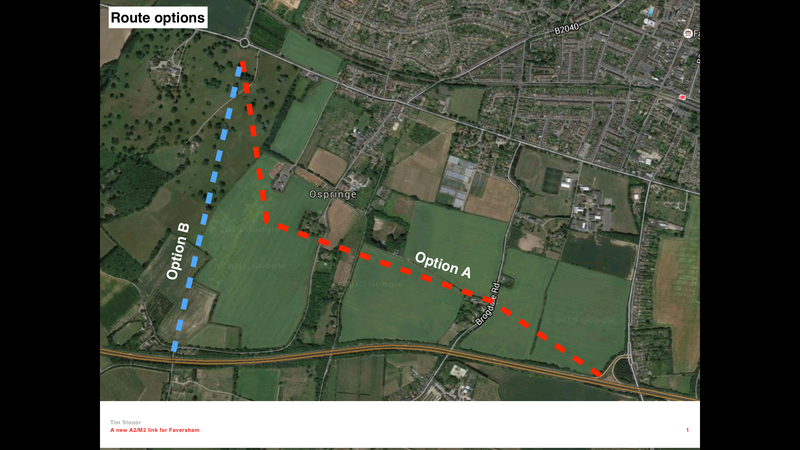 There has been increased discussion about a new link between the M2 and A2 in Faversham. I looked at this a couple of years ago, studying two options and considering the issues these raise. The fourth issue to consider is the design of the route itself. 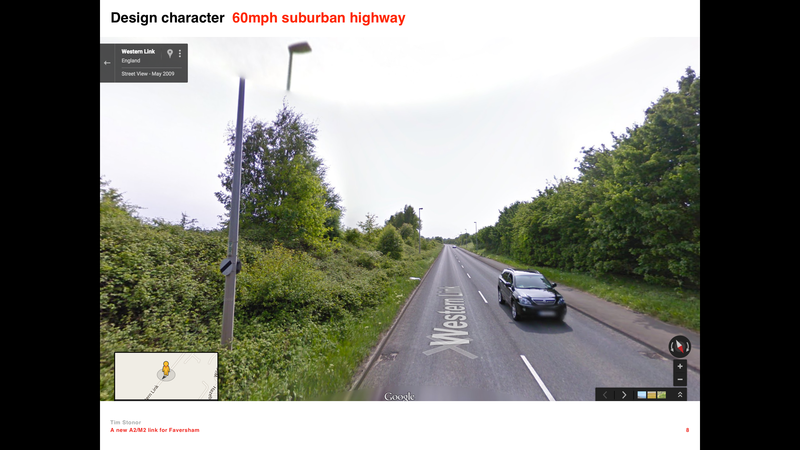 A fast suburban highway or a slow-speed urban street? Both can carry the same volume of vehicles. It’s a question of visual character, of safety, of air quality, of pedestrian and cycle friendliness and of junction capacity. Slower streets beat faster roads on every count. Option A could be designed as a street serving buildings either side of it. 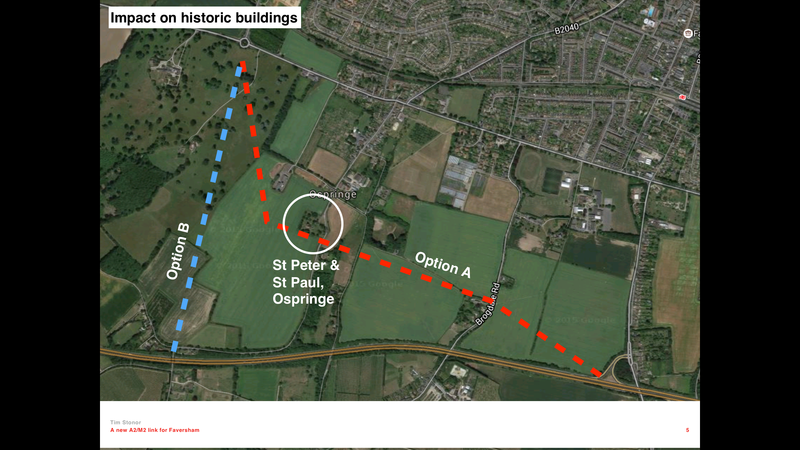 These could include industrial, job-creating buildings eg warehouses, located closer to the motorway, that would free up the current warehouses on the north-west side of town to be redeveloped as housing. 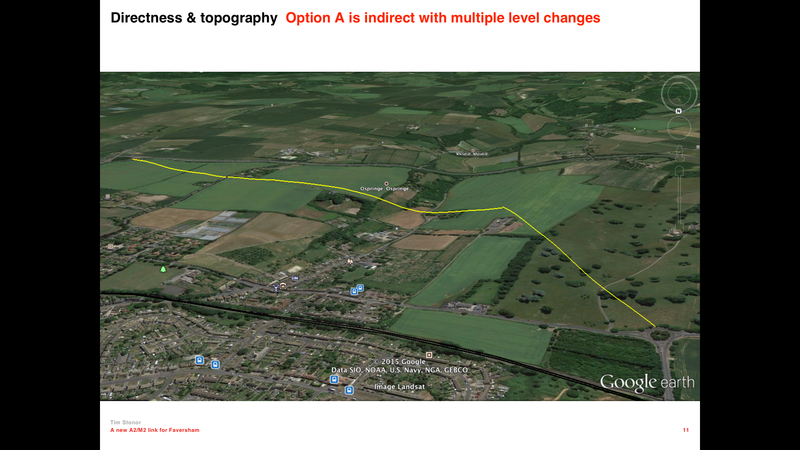 Option B could also be designed as a slower route, with buildings along parts of its eastern edge and even some on its western edge. Technically Option A in red is a boulevard (because it is an orbital route) not an avenue (which would be a radial route). So I have called it “Faversham Boulevard”. Option B in blue and Option C in red are closer to being radial routes so I have called these “Faversham Avenue”. 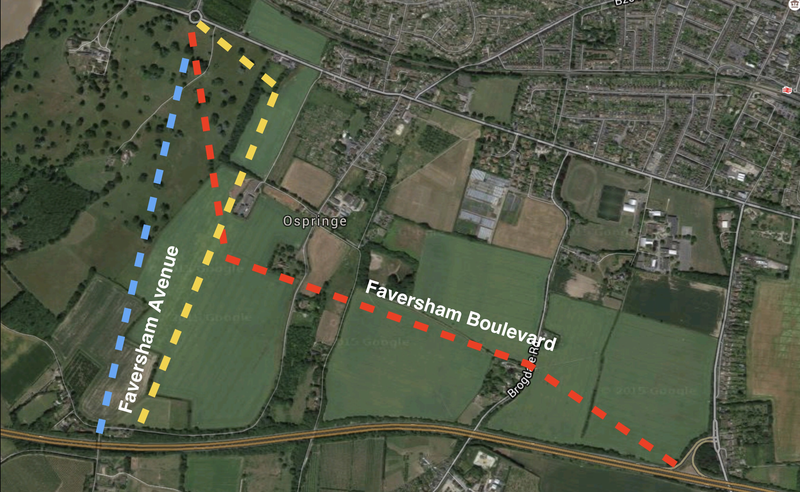 It need not be an either/or choice between Faversham Boulevard and Faversham Avenue. Both could be constructed, which would give the town resilience in the event that one of the motorway junctions were out of action (eg because of accident/repair). There might also be a new public square where the two routes meet. After all, it’s what towns have done for millennia. But is the link even needed in the first place? Is the answer to traffic problems to keep building roads? Don’t new roads just generate more traffic? My view is that, if it is just a road that is built then, yes, it will just create more traffic. However, if it is a slow-speed street, lined with buildings and providing connections into neighbouring developments then it is an entirely different and potentially beneficial proposition. As settlements grow they need to provide new main streets to add to the existing network of primary routes. Secondary routes then connect off the primary network, interlinking to form a network of local streets. This hierarchy of primary and secondary streets allows new commercial uses to be focused on the main streets so that they can both be accessed by local people and can benefit from passing through traffic. It’s how traditional towns work. Just building secondary residential streets and bypasses is not traditional and does not make commercial sense. Far from seeing these new routes as bypasses or relief roads, my view is that any new, primary link should be designed as part of Faversham’s network of main streets, designed for all modes of transport, lined by trees and buildings, with vehicles moving at a sedate and people-friendly pace, not thundering through. Therefore, rather than displacing the problem of traffic onto “relief” roads we need to embrace it and transform it by building main streets. It isn’t always that expert advice aligns with public opinion. So, when it does, how should a town council respond? 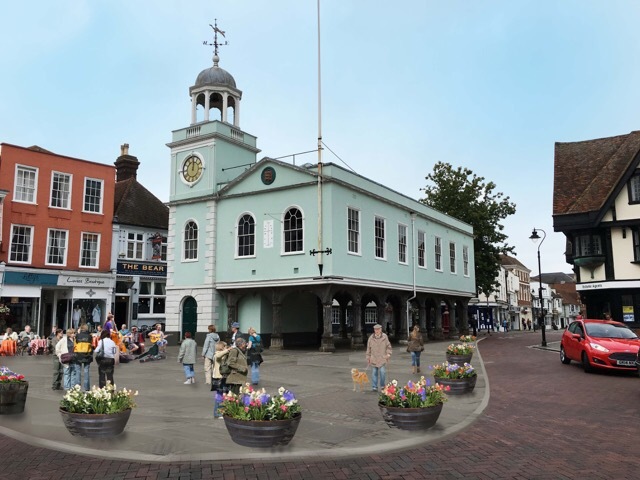 With former presidents of the Royal Institute of British Architects and the Royal Town Planning Institute against the painting of yellow lines around Faversham’s historic Guildhall, as well as knighted architects and the chairman of the Academy of Urbanism, you might take notice of the issue. When 85% of people voting in a public poll also oppose the idea you would do well to sit up and pay attention. But what did Faversham Town Council do this evening? Quite the opposite. It voted to ignore both the experts and the public. It voted to deface a cherished building by painting yellow lines around it; yellow lines that will continue to allow people to park in front of the building; that will leave us all staggered at the gall of our elected representatives. 1. A 20mph limit across the whole of Faversham to include required signage, social engagement and self-enforcing traffic calming. 4. Ongoing monitoring to identify where compliance is achieved and where further work may be required. 5. The working group’s ongoing involvement in the implementation process. 6. Support of an independent consultant with experience of devising 20mph schemes that deliver. See full report on pp69-85 of the Joint Transportation Board papers. Congratulate group on thorough report. Particularly the ongoing involvement of the group. Leave to officers to consider further. Like to see this come back to the JTB as quickly as possible. A very good job, very well done. Draw attention to Helen Whately MP letter. Congratulate Amanda Russell on presentation. Shows how passionately people in Faversham feel about this. Wanted the report to come sooner to the JTB but also wanted to a thorough job. Encourage JTB to be brave. Understand it’s controversial, especially A2. But needs to be done, esp because of future development. At present there’s very little development south of the A2. 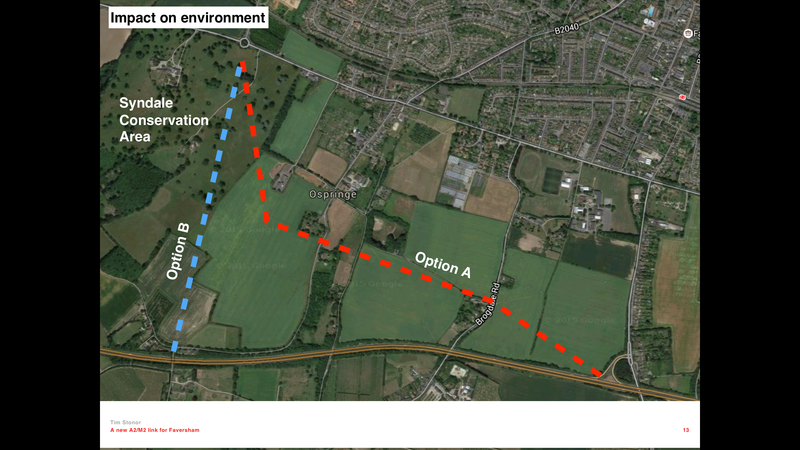 In the future, the A2 will become an internal road. No longer a bypass. Something needs to be done and now is the time to progress this. Air quality – lots of evidence that slowing vehicles so that there is less starting and stopping leads to better air quality. In summary, there are implications for budgets but ask JTB to be brave and give this its full backing. Also a member of group. Learned a lot through the process. As you learn more, you learn how important it is. A2 is important. Will no longer be a peripheral road. Abbey School bridge – an alarming number of people are not using the bridge. Not a simple safety issue. But its also about pollution. 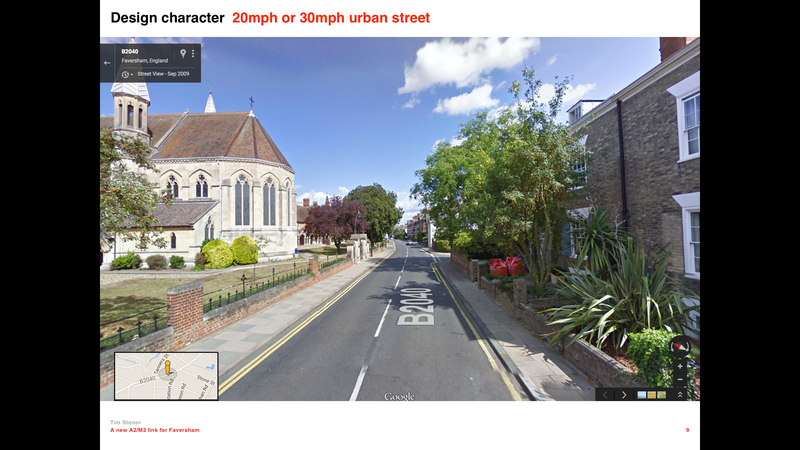 20mph for cars helps people make a 20minute walk across Faversham. Will improve potential for cycling. Just back from Bristol – heading towards 20mph and safe to walk. Will bring a major benefit to everyone living in Faversham. There is more than one stage in the process. Creating a 20mph limit is the first step. Identifying other areas is the next step. Hope committee will give it its full support and urge KCC to give it support and funding. Whereas supportive of all the recommendations, concerned some parts of borough going ahead without others. Need to start looking at process for implementing across the borough. It’s taken one year for Faversham so it will take many years for Sheppey and elsewhere. Chances of getting KCC to fund this are virtually nil. Maybe community grant. This council should make a decision to fund borough-wide. £150-180k borough wide is worth serious consideration. Propose amendment to make borough-wide. Catching up the USA – with restrictions. Cost – don’t want to hear they haven’t got money. Get from enhanced value of land? I fully agree with everything that’s been said. Down to JTB to grasp it and make it happen. It won’t stop persistent speeders. Need to put pressure on enforcement authorities to make sure there’s proper enforcement. What is SBC doing about it? 2. Enforcement – shouldn’t stop us pursuing things. Once it’s down to a few, police may let us have stingers. Four hot spots. Clusters are at pedestrian crossings. We need pelicanised crossings as a quick fix. Forbes Road is dangerous if a bus is turning. All can be fixed with pelicanised crossings. Other hotspot is St Mary’s Road. But I support the scheme and would like the quick fix if we can get it. Iwade looked at 20mph. Has money for signs. But Parish Council voted against as speeds were 26mph. Needs physical measures. Congratulate group – v professional. Pity I wasn’t able to do it around schools. There is a groundswell around UK. Need enforcement – works extremely well in Minster. It works. Tend to work more in operations. If someone else from transport came here then they would want to take it on. V good work. Not much difference in accident rates between signals and zebras. Need clarification on build up from 30 to 60. Need further discussion about A2. Not saying impossible but needs further work. If approved, technically goes to KCC cabinet but should also go to Swale cabinet. The support of people in the room is testament to the quality of the report. To accept the recommendations of the Working Group’s report with an amendment to pursue a 20mph limit on residential streets across the borough. Newcastle City Council’s plans for the Blue House Roundabout are appalling and unnecessary. I know the junction and have walked and driven across it more times than I can remember. The last thing it needs is what is proposed and I intend to do what I can to help stop the scheme. Yet the more weight that can be brought against these unnecessary, expensive and car-centric proposals, the better. Don’t let this nonsense be foisted any further. Take Newcastle forwards not backwards. 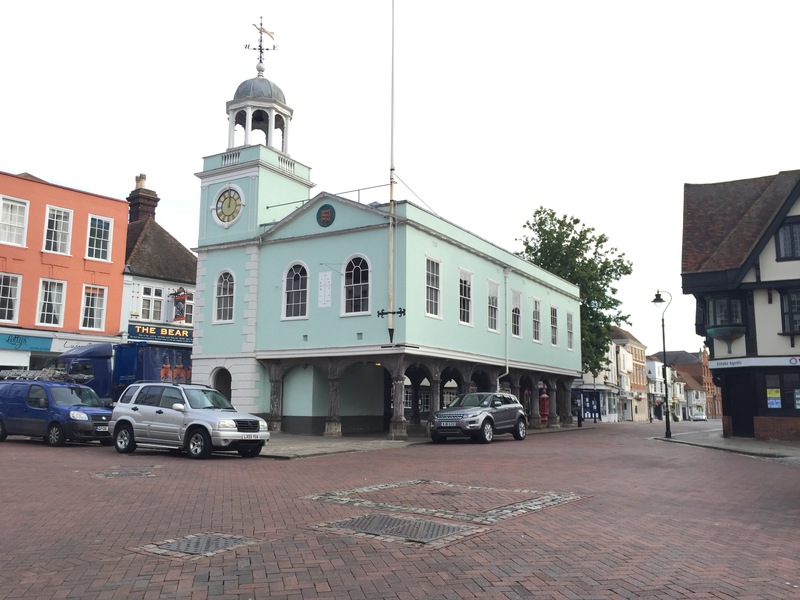 How can the space around the Guildhall in Faversham be improved? How can the heart of the town look more attractive to residents and visitors alike? How can vehicles be prevented from parking outside and blocking the view of the historic Guildhall? How can outdoor dining be better accommodated? How can more safe space be made for pedestrians? 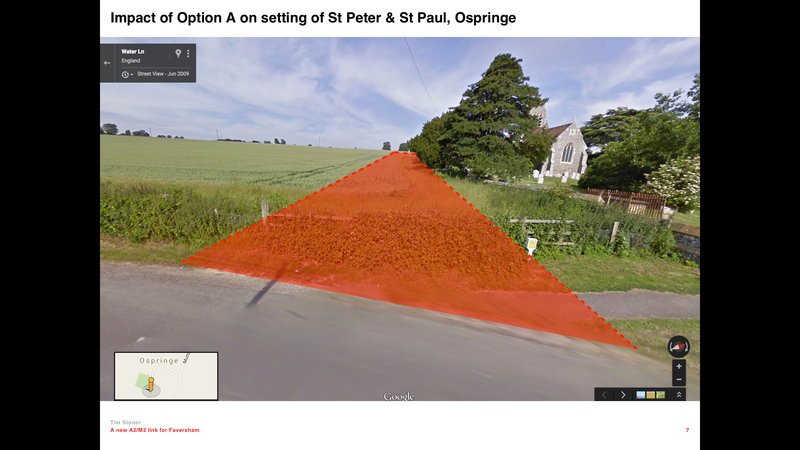 In response to these questions Morrison Brink Stonor Architects has developed a proposal to extend the stone plinth beneath the Guildhall, thereby removing the space available for vehicles to park there. And we’ve added planters to further dissuade drivers. This is a first sketch of the design concept. The planters could be differently shaped. They could be replaced with bollards. They could incorporate benches. There could be more of them or fewer of them. They could be on lockable wheels. Or the market could work around them. There will be a cost to extending the plinth but the planters could be put in place first. It’s a vision of how Faversham could be. And of course it’s a pleasant alternative to painting double yellow lines around the Guildhall, lines that won’t even stop vehicles parking in front of the Guildhall because Blue Badge holders will still be able to park on them. Next steps are to consult with the Town and Borough Councils, Faversham Society and people generally. We’ve taken some initial soundings and had positive responses. Quite rightly several people said this could only go ahead if it didn’t interrupt the market. We have had an initial meeting with the Market Manager and the idea was well received since it makes the market bigger and better by removing vehicles and parking. Kent County Council typically over-designs and over-costs transport projects. 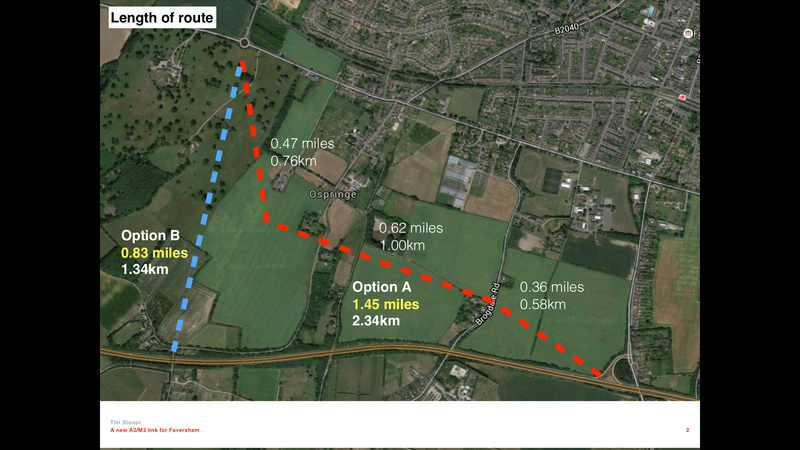 In contrast, a 20mph speed limit can be implemented at a fraction of the price of conventional, car-centric solutions such as the hugely costly and unnecessary A2/Ashford Road roundabout. Faversham has a clear “urban footprint” with a small number of ways in and out – and therefore a small number of places that need gateway signage. The Town Council has already identified the need to upgrade the gateway signage to update and improve the existing signs. It has already identified funding to do so. Adding a 20mph roundel to the gateway signage should now be part of the sign designer’s brief. By combining budgets in this way, more can be done with available resources. Faversham needs more joined up thinking as well as a more joined up network of routes that are safe and convenient for walking and cycling. Now is the time for action. Future generations will judge us on what we do next.